Increase consumer loyalty and profits while lowering your customer acquisition costs. 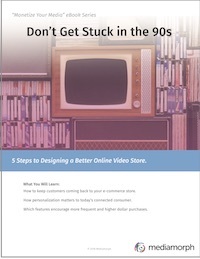 Back in the “dark ages” of the 1990s, cable channels were growing at a remarkable pace, the theatrical movie going experience still reigned, and only at the end of the decade were DVDs introduced to bring higher quality home viewing options. Today's home entertainment consumer has lots and lots of choices. This eBook identifies the top five trends for making these consumers favorite your business, while lowering your customer acquisition costs and increasing your profits.